The aim of the work was to define the differences between boys selected for football training and their peers at the beginning stage of different team sports training, as well as those that do not practice any sports discipline. The research material consisted of 97 schoolboys at the age of 10 selected to practice team sports, including football, and 39 non-training boys. All boys attended Szczecin primary schools. Apart from the basic anthropometric characteristics, the following motor skills were analyzed: kinesthetic differentiation, reaction speed, movement frequency, spatial orientation, static balance, maximal lactic anaerobic power, maximal non-lactic anaerobic power, fast muscle activation, aerobic endurance and absolute muscle strength. Not all test results are expressed in SI units. Data obtained through the applied method served as the grounds for defining a profile of a “young football player” as the premise to improve the process of preliminary selection for football. Candidates selected for soccer training presented higher level of kinesthetic differentiation than all other examined boys. They also presented higher level of movement frequency than volleyball players and higher level of space orientation than the not-trained boys. Soccer players nevertheless presented lover level of time of reaction than the candidates selected for basketball training. Results of all condition abilities tests’ obtained by soccer players were statistically significant better than the one obtained by the untrained boys (p≤0.001) and the candidates for volleyball training (p≤0.05, p≤0.001). The greatest differences were noticed in tests of aerobic endurance and maximal non-lactic and lactic anaerobic power. 1. Bompa T. Talent identification. Science Periodical on Research and technology in Sport. Ottawa 1985. 2. Chudecka M. Body build of female basketball players (doctoral dissertation) [in Polish]. AWF. Poznań 2000. 3. Eurofit. European Test of Physical Fitness. Brussels 1988. 4. Fajfer Z. How to increase effectiveness of selection process in football? Sport wyczynowy. 2001; (5-6): 30-39. 5. Fajfer Z. Searching, supporting and selecting talented young people playing football in Czech Republic [in Polish] (in:) Nowoczesna gra w piłkę nożną. 2003: 43-51. 6. Gołaszewski J., Wieczorek A. The body structure and the motor fitness of the selected young football players, (in:) Modern football. Theory and Praxis. 2001: 169-175. 7. Malina R. Talent Identification and Selection in Sport. Institute for the Study of Youth Sports. Michigan State University 1997. 8. Mekota K., Blahus P. Motor skills tests in physical education [in Czech]. SPN. Praha 1983. 9. Mynarski W. The internal structure of motor skills in children and young people at 8-18 [in Polish]. AWF Katowice 2000. 10. Naglak Z. Methodological aspects of selecting children and young people for sport [in Polish]. AWF. Wrocław 1989. 12. Ozimek M., Staszkiewicz R. Estimating correctness of selection for the basic training in football [in Polish}. Sport wyczynowy. 1999; (5-6): 65-71. 13. Peltola E. Talent Identification. New Studies in Athletics. 1992; (7): 7-12. 14. Piechaczek H., Lewandowska J., Orlicz B. Monographic estimation of selecting children for sports classes [in Polish]. Wychowanie fizyczne i sport. 1995; (3): 21-27. 15. Raczek J. Mynarski W., Ljach W. Theoretical and empirical basis of developing and estimating coordinative motor skills [in Polish]. AWF. Katowice 1998. 16. Reilly T., Williams A., Nevill A., Franks A. A Multidisciplinary Approach to Talent Identification in Soccer. 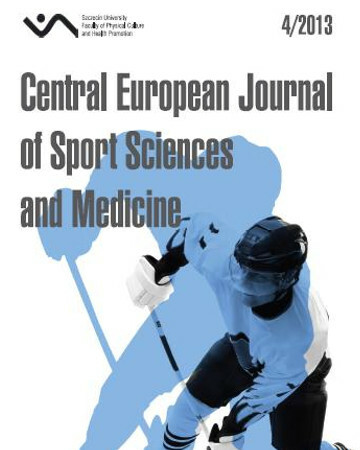 Journal of Sports Science. 2000; 695. 17. Rushton C. Talent detection, identification and development ... a swimming perspective. Swimming. New Zealand 2003. 19. Spieszny M. The analysis of somatic features, motricity and technical-tactic abilities of young sportspeople who train handball [in Polish]. Monograph AWF. Kraków 2011; 3. 20. Stanisz A. Statistics course with the use of STATISTICA PL programme presented on given examples from the field of medicine [in Polish]. StatSoft. Kraków 2000: 85-104, 171-177. 21. Stępiński M., Zwierko T., Florkiewicz B., Dębicka J. The level of chosen motor abilities of 13 years old soccer players. Journal of Human Kinetics. 2003; (9): 99-106. 23. Szopa J., Mleczko E., Żak S. The rudiments of Kinesiology [In Polish]. PWN. Warszawa-Kraków 1996. 25. Woodman L. Talent Identification - is competition enough? Sports Coach. 1985; (9): 49-59. 26. Ziemainz H., Rütten A., Roeger U. Talent identification - selection and development. Problems and perspectives. AFRA. 2004.